In a mystical castle hidden away in a dense forest somewhere in France, there lies the cutest little teacup you've ever seen. The castle in Beauty and the Beast is a weird enough place to end up at while searching for your missing father but just imagine growing up there. Mrs. Potts must have been in a constant state of stress while her fragile porcelain son used the castle as his personal jungle gym. Ha may have road the dumbwaiter or swam in the sink while the other dishes were just trying to get clean, considering his enchanted circumstances, Chip has always had a handle on adventure. We don't give the little guy the credit that he deserves. If you think about it, he saved the day in the animated version of Beauty and the Beast. If Chip hadn't slipped into Belle's satchel with the mirror, Belle and her father would have remained locked up while the castle was under attack by the townspeople. Without him, the beast would have remained a beast, Chip's mother would have remained a teapot, and of course, we're happy he turned back into a boy but we sure love that bubble trick that he got so good at over the years. If your little one is curious and mischievous then he'd have a great time hamming it up as Chip. 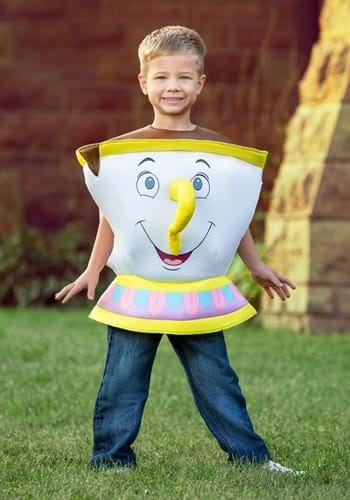 For this costume, we skipped the breakable china and made an adorable foam version of our porcelain hero. Now your little boy can play, sing, and dance without worrying about getting another chip. At the end of the night, take the opportunity to say, "Off to the cupboard with you now, Chip, it's past your bedtime! ".